Due to the strength and growth of the Linux community, Measurement Computing has expanded our Linux support options for many of our data acquisition devices through the newly developed Universal Library for Linux. UL for Linux is open source, with the source code available on GitHub for you to compile on your distribution of Linux. To get you started, we have provided simple console examples in both C and Python. If you’d like to create an application with a user interface, there are various toolkit libraries that you can use on Linux operating systems. To demonstrate, I have written an example program in C on a Debian OS, using GTK+ 3.0 for the GUI controls, and Code::Blocks as the IDE. 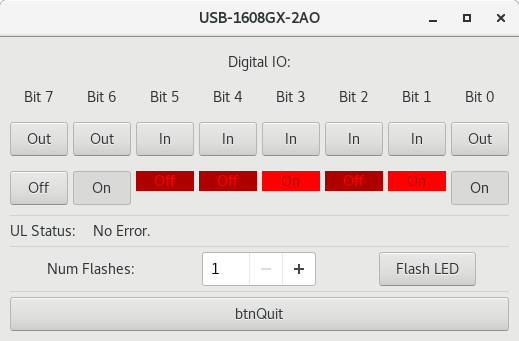 This example demonstrates the use of a USB-1608G series board and allows you to configure the digital I/O bits for input or output by toggling buttons for each bit. The main.c file is attached here. If you have any questions, please leave us a comment or reach out to our technical support team.